Premium cuts of hand-picked beef are marinated in the Chef’s own soy sauce, horseradish and Worcestershire sauce. 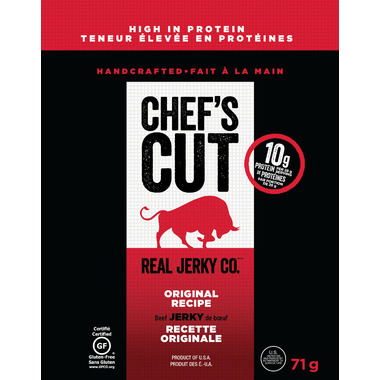 This unique blend, combined with the proprietary smoking process, gives Original Recipe Real Steak Jerky the perfect proportion of salty, spicy and sweet. 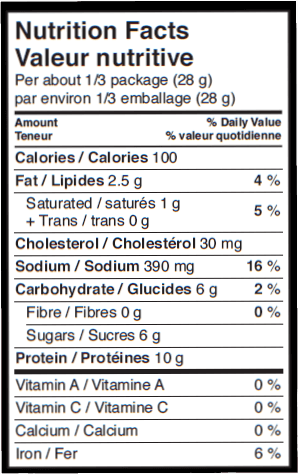 Beef, soy sauce (water, sugar, salt, hydrolyzed corn and soy protein, caramel colour, natural flavour, cultured dextrose, lactic acid, green tea extract, mustard oil), sugar, worcestershire sauce (vinegar, molasses,sugar, water, salt, onions, anchovies, garlic, cloves, tamarind extract, natural flavourings, chili pepper extract),horseradish (horseradish roots, vinegar, salt and mustard oil), liquid smoke (water, natural hickory smoke flavour, vinegar, molasses, caramel colour and salt), cultured celery powder, sea salt, black pepper, red pepper. Contains soy, anchovies and mustard.